When you’re figuring out what to do in Seoul, don’t skip out on the cool & wacky neighbourhood of Hongdae. Set in western district of Mapo-gu, Hongdae flourishes with creativity and a youthful vibrance that makes it unlike any other place in Seoul. In Hongdae, a name crafted from the fusion of the first two Korean syllables of nearby Hongik University (Hongik Daehakgyo), you’ll find a unique vibe that puts quirky cafés, yummy restaurants, happenin’ clubs, edgy fashion boutiques, and some of best street art in Seoul at the forefront. First time in Hongdae? Set your sights on the main drag of Hongik University Street. Often called Hongdae Walking Street, this vibrant street and its surroundings are where much of the action of Hongdae resonates. Along it, you’ll find an assortment of cafés, restaurants, bars, and even an outdoor stage where indie band crank out tunes for onlookers. 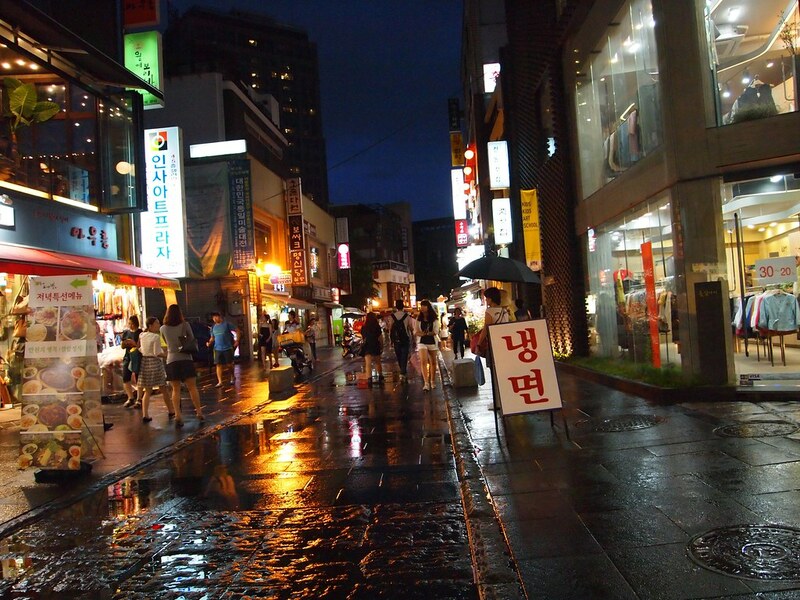 Hongdae University Street is also famous for being one of best places to shop in Seoul. Whereas Myeongdong is the go-to for cosmetics, Hongdae Walking Street is where young people go to fill their wardrobes with hip fashions at decent prices. Whatever you do, don’t miss the spectacle of parading down Hongdae Walking Street on a Friday night when this neighbourhood surges to its craziest. Getting to Hongik University Street: Take line 2 of the Seoul metro to Hongik University Station. Use Exit 9 and turn left. Hongik Walking Street (Eoulmadang-ro) is two blocks away. It’s no shocker that the weird & whacky Trick Eye Museum Seoul chose Hongdae as its home. Whether you’re young or old, expect to have a ton of fun at this unique & innovative modern museum. As its name implies, the Trick Eye Museum Seoul uses parallax effects and other visual trickery to draw you into impossibly odd art as the subject. You’ll ride mythical sea creatures, join historical scenes or shrink down to the size of a coffee cup—among a multitude of other outrageous situations! Although these types of displays are popping up all over the world, what makes the Seoul Trick Eye Museum unique is that it combines the two-dimensional wall murals with high-tech augmented-reality via their own Trickeye Camera app. You ticket to the Trick Eye Museum Seoul also includes admission to the Ice Museum, a cool (literally!) museum featuring a handful of ice sculptures, an ice hotel room, and an ice slide for the kids. Want to save money on your entrance? Book your Trick Eye Museum Entrance Ticket before you go and save 18% off of the admission price! Getting to Trick Eye Museum Seoul: From Exit 9 of Hongik University Station (Line 2), turn left and walk straight down Yanghwa-ro. Turn left at Hongik-ro. Walking two blocks up, turn right at Hongik-ro 3-gil. The Seoul Trick Eye Museum will be on your right, 1.5 blocks ahead. There’s no more unique or entertaining of a performance in Seoul than at the Hongdae NANTA Theatre. 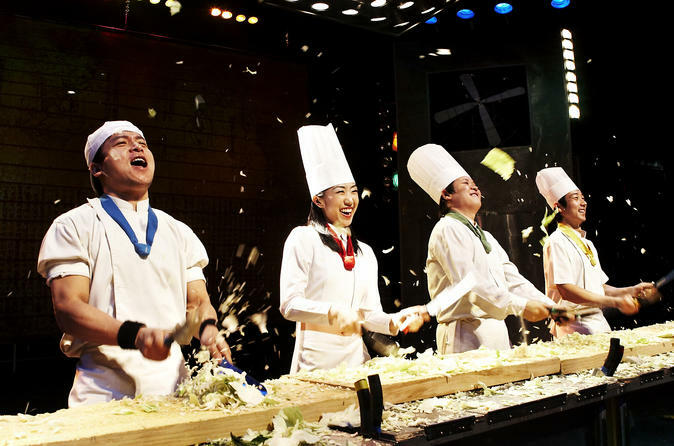 Even if you’re not normally a fan of the dramatic arts, this satire Korean cooking show is huge fun for all ages and a must-see while visiting Hongdae. The performance at the Hongdae NANTA Theatre is, like the famous Blue Man Group, completely non-verbal, relying on the dramatic expressions of the talented actors and actresses to draw the audience in. No doubt this show will have you in stitches from beginning to end! If you grab one of the front seats at the Hongdae NANTA Theatre, don’t be surprised if you get chosen to join in on the act! Want to save money on your NANTA ticket? Book a Hongdae Nanta Show Discount Ticket before you leave to save 20% on admission! Getting to Hongdae NANTA Theatre: From Hongik University Station, take Exit 9 and walk west on Yanghwa-ro. Turn left two blocks ahead on Yanghwa-ro 16-gil. You’ll find the Hongdae NANTA Theatre two blocks up on the corner of Yanghwa-ro 16-gil and Hongik-ro 5an-gil. The spirit of Hongdae shows its true colours along Hongdae Mural Street (also called Picasso’s Street). This narrow alleyway (Wausan-go 22-gil), following the walls of Hongik University from the main gate to Dongmak-ro 19 gil, features some of the best street art in Seoul from brightly painted cartoon murals to politically-charged expressions. 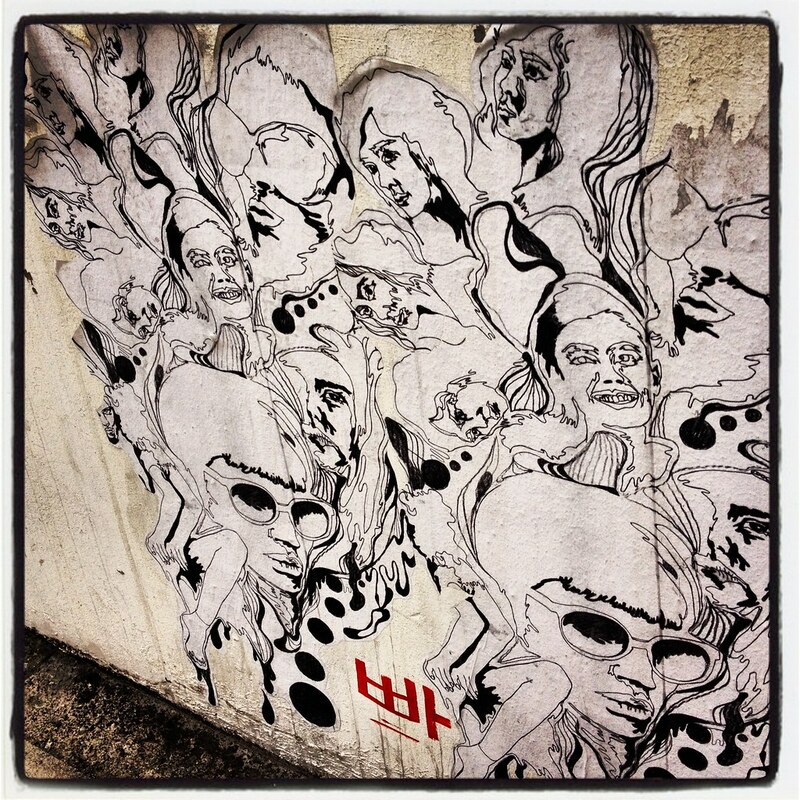 What’s most fascinating about Hongdae Mural Street—and, indeed, Hongdae in general—is that it’s always in flux. A fantastic painting or passionate slogan might disappear and be replaced by something equally awe-inspiring (or dreadfully boring!) at any time. Getting to Hongdae Mural Street: Take Line 2 to Hongik University Station. From Exit 9, walk straight down Yanghwa-ro, turning left at Hongik-ro. Follow the road to the main gate of Hongik University at Wausan-ro. You’ll see the start of Hongdae Mural Alley to the right side oof the outer side of the gate. Looking for one of the most interesting cultural experiences in Hongdae? Pencil in a visit to the Hongdae Free Market on a Saturday afternoon between March and November to see the city’s most artistic and creative folks at work. Unlike at a regular flea market, the exhibitions here feature original handmade items created by local artists rather than typical used consumer goods. 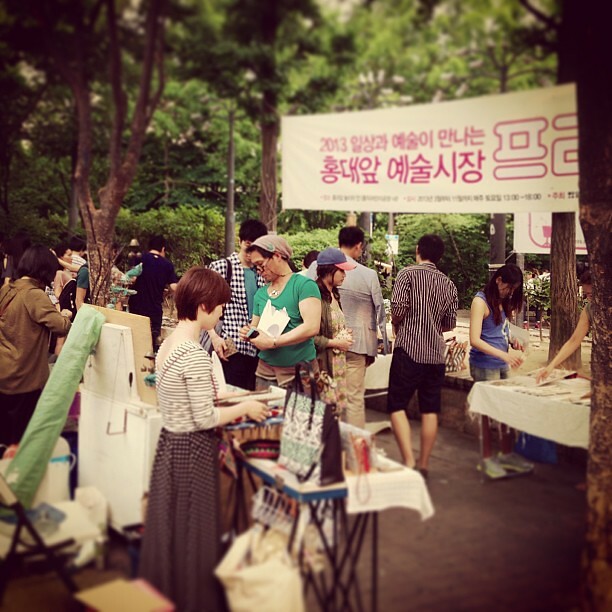 At Hongdae Free Market, you’ll get to peruse through unique artwork, handicrafts, and clothing accessories. The marketplace also features a stage where local bands perform to add to the lively atmosphere. Getting to Hongdae Free Market: From Exit 9 of Hongik University Station (Line 2), walk one block west on Yanghwa-ro to Hongik-ro. Turn left and walk towards Hongik University. When you reach the main gate at the end of Hongik-ro, hang right. The Hongdae Free Market is located in the space between the two streets at the Y-junction. With the Hello Kitty Café’s Hongdae location long gone, the undisputed king of “weird places to sip on a coffee” is definitely the Meerkat Café. Asia’s fascination with animal cafés is hardly a surprise, but crawling with meerkats—and other animals like an arctic fox, raccoon, kitten, genet & wallaby—this Seoul hotspot takes the cake for inducing some serious Korean culture shock! As a word of warning: Don’t dress up in your Sunday best to visit the Meerkat Café. Although playful, these mischievous little devils may dig at your clothes or bite. They’re also expert pickpockets, and will grab belongings from your jeans (fortunately, you’ll be required to empty your pockets anyway). Getting to Meerkat Café: Take Exit 9 at Hongik University Station, walking down Yanghwa-ro and turning left at Hongik-ro. Follow the street until you reach the main gate of Hongik University. Turn right and keep right at a Y-junction. One block up, turn left at Wausan-ro 21-gil. The Meerkat Café is in the third building to your right on the 3rd floor. With the massive population of hungry university students, it shouldn’t be much of a surprise that Hongdae is one of the best places to eat in Seoul. 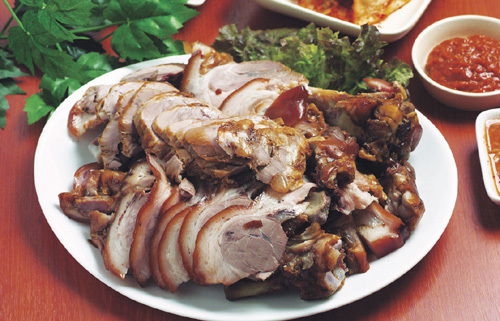 Myth Jokbal (23-1, Eoulmadang-ro): A favourite in Hongdae serving up a succulent garlic jokbal (pig’s feet) that’s among the best in the city. Hongdae Dakgalbi (32, Hongik-ro 3-gil): A fairly non-descript restaurant on a quiet side street specializing in dakgalbi (spicy stir-fry chicken). Kyochon Chicken Hongdae (362-15, Seogyo-dong): Move over Colonel Sanders! This famous Korean chain restaurant rocks out some of the best Korean fried chicken on the planet. Visit with a friend (or two!) to test out several different flavours including garlic soy, honey, and spicy red pepper. Seoul Pub Crawl & Party: Let the legendary nightlife of Hongdae or Itaewon get under your skin on this tour of the hottest party spots in Seoul. Includes free skip-the-line entrance to 10+ Seoul clubs and a guided group visit to 4 bars & pubs. Moonlight Riverview Bike Ride & Korean Market Food Tour: A unique evening cycling tour zipping along the Hangang River with stops at Mangwon Market, one of the best destinations for street food in Seoul, and at the nearby Mapo Fish Market, a lesser-known Seoul gem. Korean Culture Day Tour: A full-day tour focusing on the top cultural attractions in Seoul including Jogyesa Temple, Gyeongbokgung Palace, Cheongwadae (Presidential Palace), and a visit to a traditional Korean folk village. Hotel pick-up and drop off is included. 9 Brick Hotel: An delightful hotel featuring modern guest rooms and elegant common areas with European-style flair. Hotel is located just blocks away from the some of the best things to do in Hongdae. L7 Hongdae: A brand-spankin’-new 4-star hotel set in a superb location just one block from Hongik University Station. Rooms are ultra-modern, colourful, and super stylish. RYSE, Autograph Collection: The first full-on 5-star luxury hotel in Hongdae. From the moment you enter the lobby until your head hits the pillow, you’ll be absolutely absorbed by the unique design aesthetic and elegance of this brilliant new offering on the Hongdae accommodations scene. Want to experience Hongdae’s weirdest attractions? Visit the quirky Meerkat Café, one of the oddest places on earth to drink a coffee, or the Trick Eye Museum Seoul to belly a few laughs with some friends. Got a craving for some Korean food? Chow down on some delicious dakgalbi at the aptly, yet unimaginatively named, Hongdae Dakgalbi or some greasy and mouth-watering Korean fried chicken at Kyochon Chicken Hongdae. Looking for an interesting cultural experience? Get entertained by the amazingly funny “cooking-class” performance at Hongdae NANTA Theatre or explore the unique creations of Seoul’s most talented artists at the Hongdae Free Market. Myeongdong: Seoul’s shopping & street food mecca is just a 20-minute subway ride from Hongik University Station via Seoul Station. Get started exploring with this list of the best things to do in Myeongdong. Insadong: Explore the antique shops, art galleries, and traditional teahouses of one of central Seoul’s most interesting neighbourhoods. Dig into it big with this guide to the best Insadong attractions. Itaewon: Love it or hate it, you’ll likely feel most at home in Seoul at this edgy, foreign-friendly district near the U.S. Army Base. Gangnam: Witness the high style that PSY slyly pointed to firsthand in this upper-crust Seoul neighbourhood.